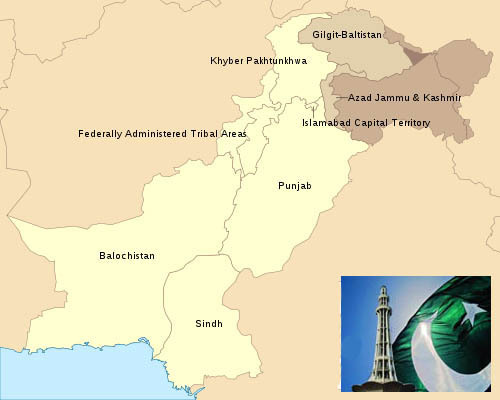 Pakistan, officially the Islamic Republic of Pakistan, is a sovereign country in South Asia. With a population exceeding 180 million people, it is the sixth most populous country in the world. Located at the crossroads of the strategically important regions of South Asia, Central Asia and Western Asia, Pakistan has a 1,046-kilometre (650 miles) coastline along the Arabian Sea and the Gulf of Oman in the south and is bordered by India to the east, Afghanistan to the west and north, Iran to the southwest and China in the far northeast. It is separated from Tajikistan by Afghanistan's narrow Wakhan Corridor in the north, and also shares a marine border with Oman. The territory of modern Pakistan was home to several ancient cultures, including the Neolithic Mehrgarh and the Bronze Age Indus Valley Civilisation, and has undergone invasions or settlements by Hindu, Persian, Indo-Greek, Islamic, Turco-Mongol, Afghan and Sikh cultures. The area has been ruled by numerous empires and dynasties, including the Indian Mauryan Empire, the Persian Achaemenid Empire, the Arab Umayyad Caliphate, the Mongol Empire, the Mughal Empire, the Durrani Empire, the Sikh Empire and the British Empire. As a result of the Pakistan Movement led by Muhammad Ali Jinnah and India's struggle for independence, Pakistan was created in 1947 as an independent nation for Muslims from the regions in the east and west of India where there was a Muslim majority. Initially a dominion, Pakistan adopted a new constitution in 1956, becoming an Islamic republic. A civil war in 1971 resulted in the secession of East Pakistan as the new country of Bangladesh.